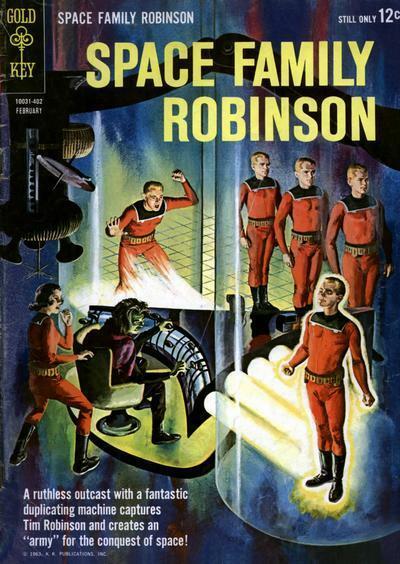 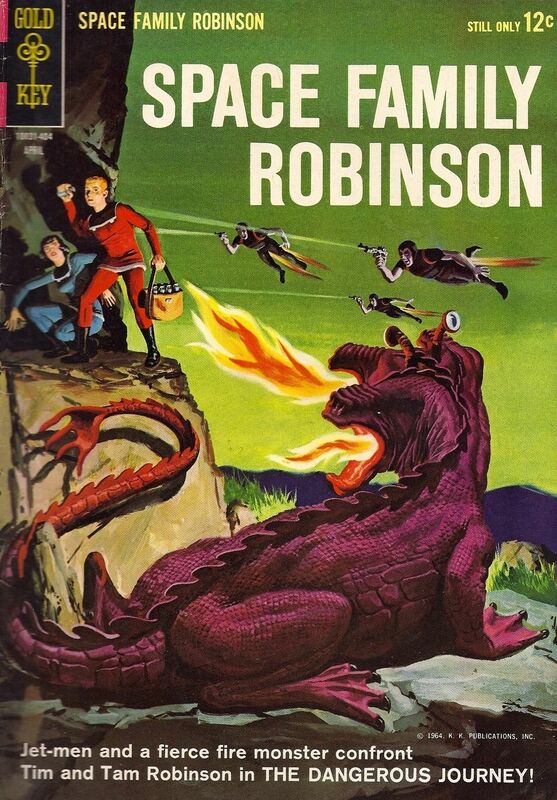 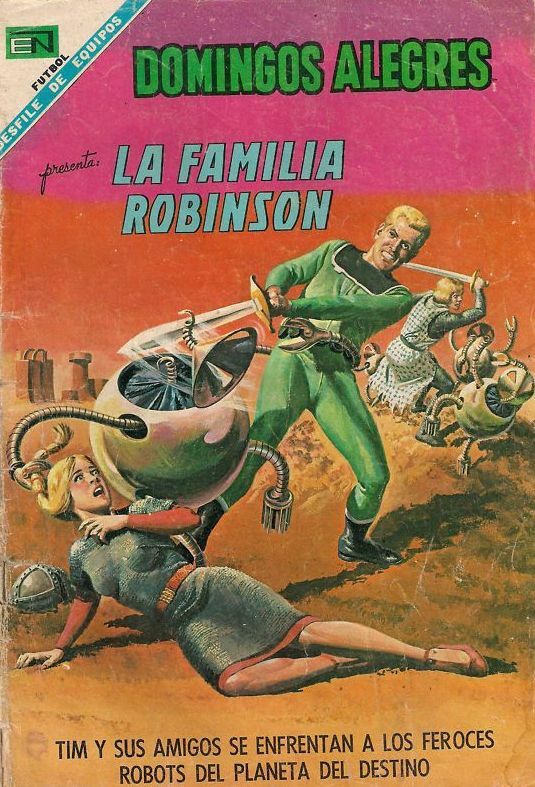 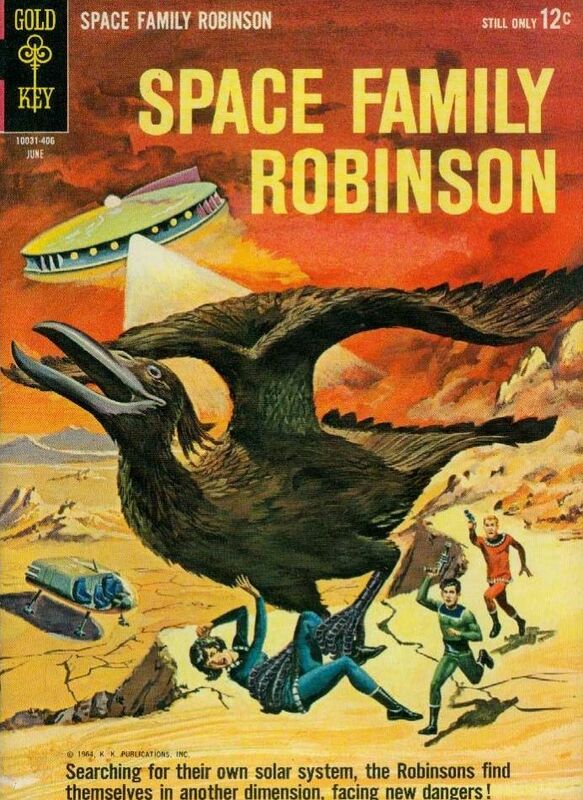 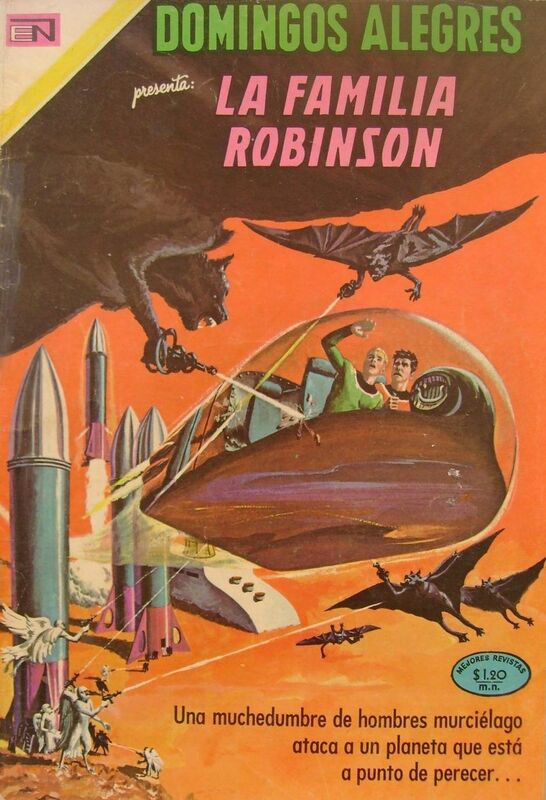 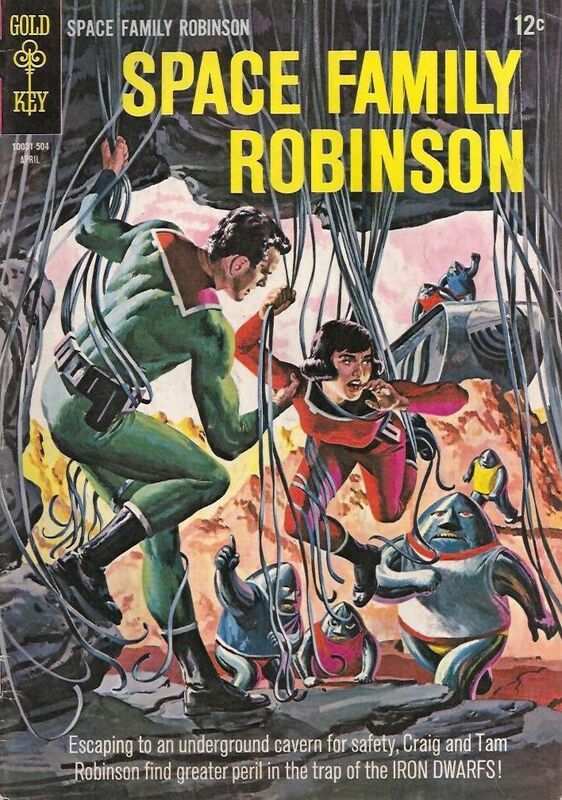 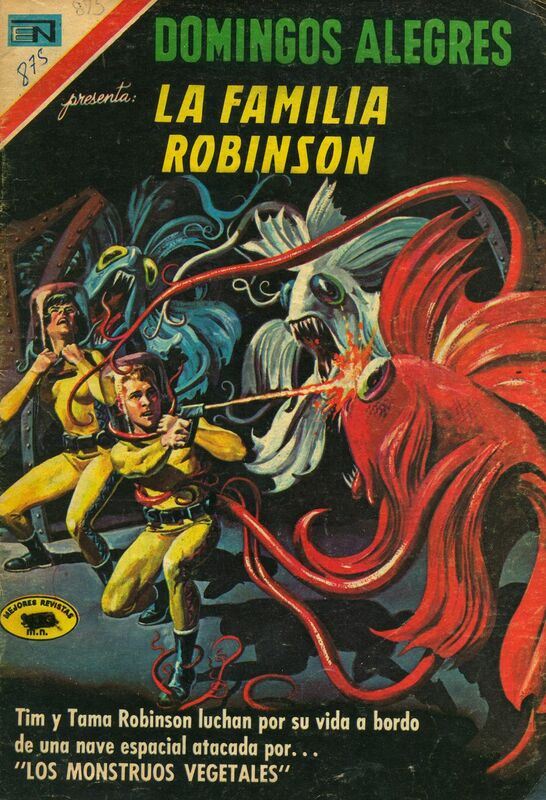 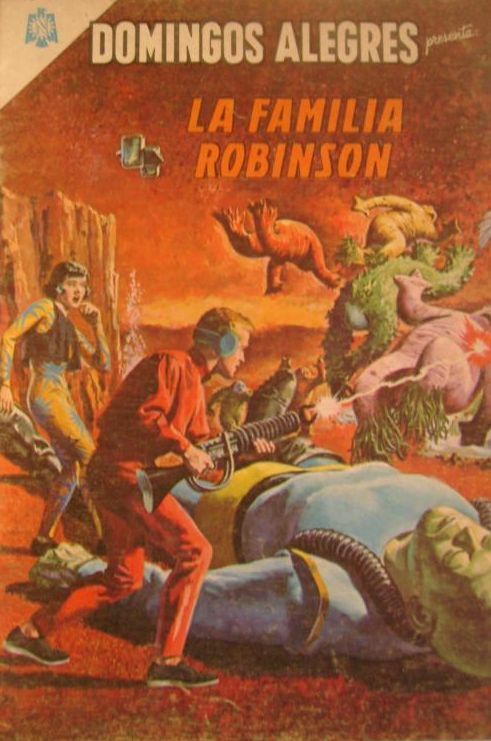 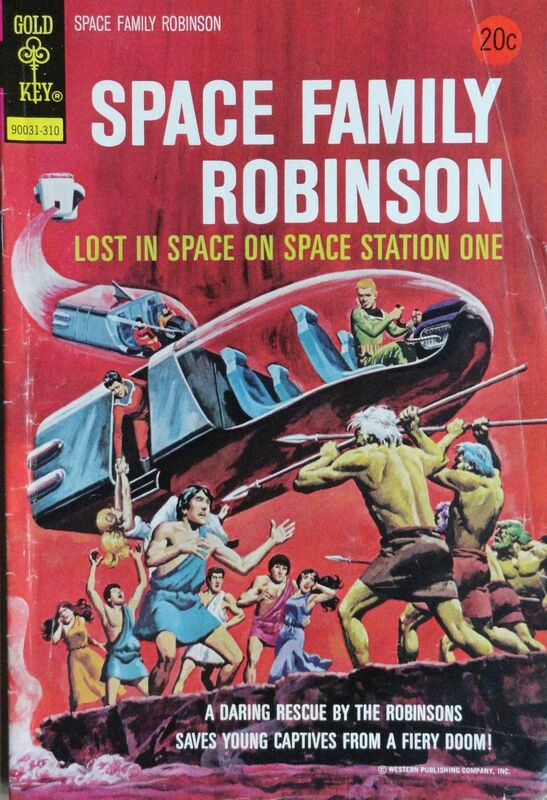 Space Family Robinson was an original science-fiction comic book series published by Gold Key Comics. 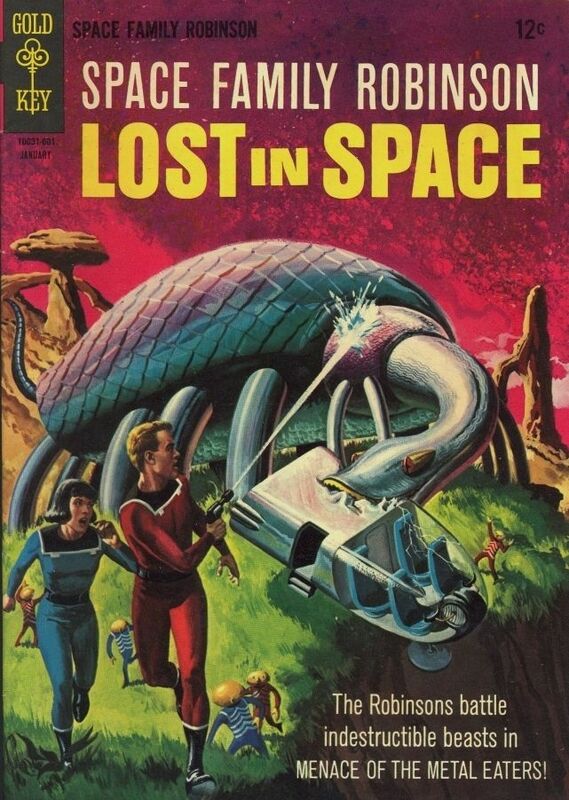 It predates the Lost in Space TV series. 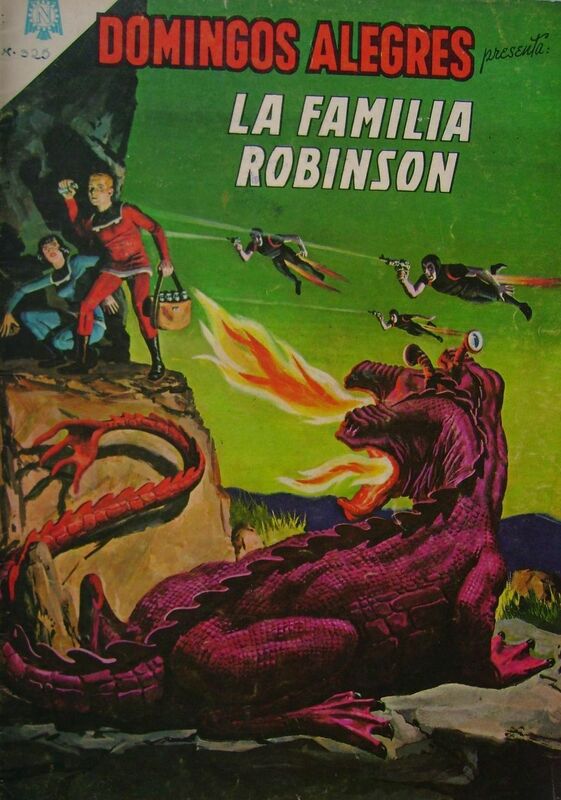 Both are loosely based on the novel and identically-named movies, Swiss Family Robinson. 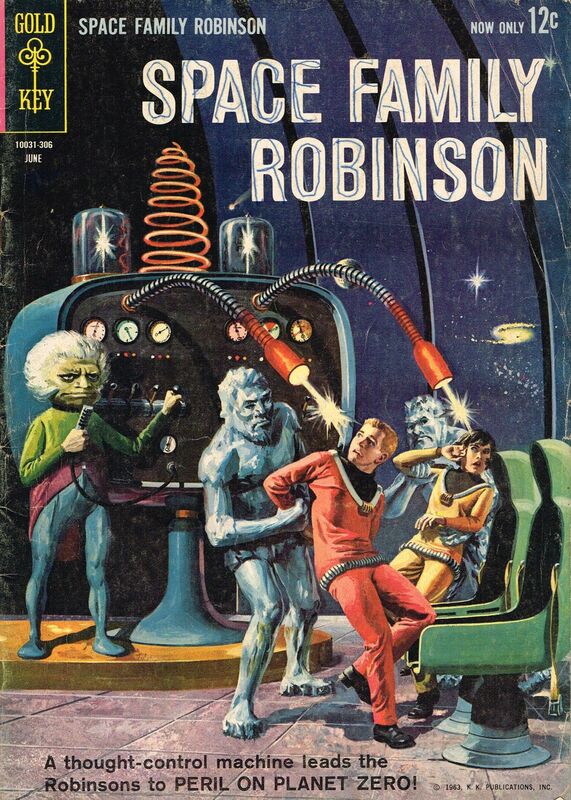 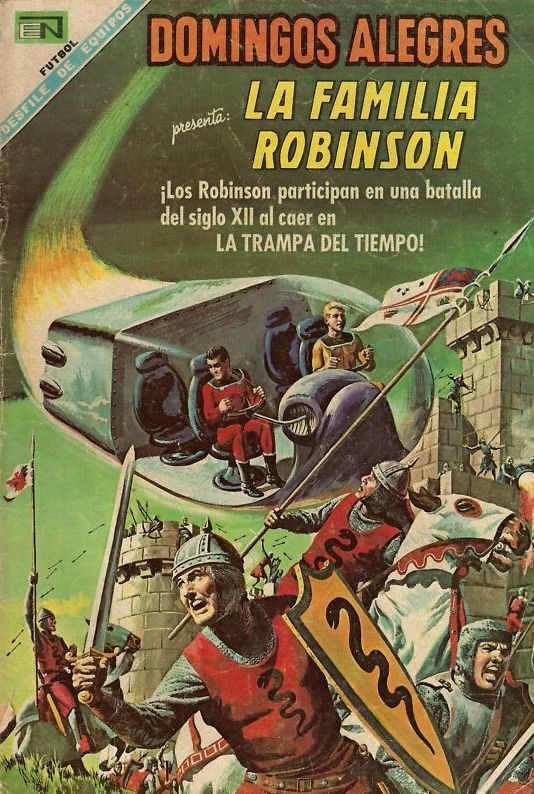 Space Family Robinson was published as a total of 59 issues, from 1962 to 1982. 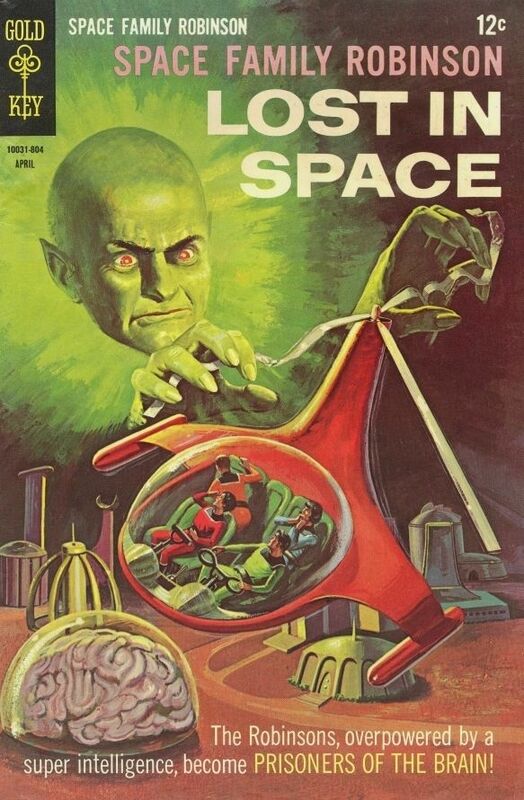 The first issue was published in December 1962. 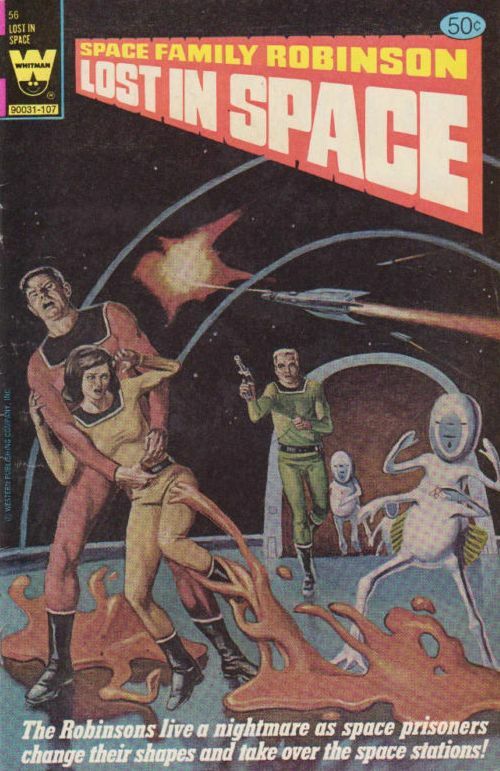 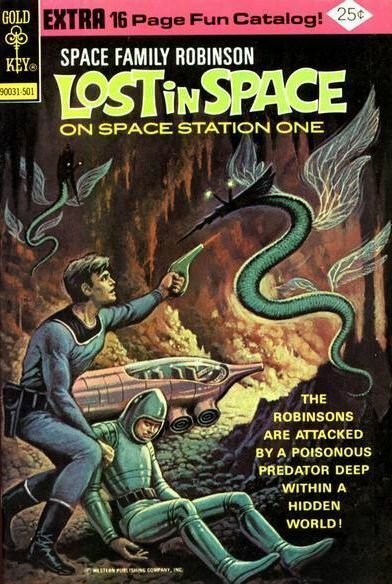 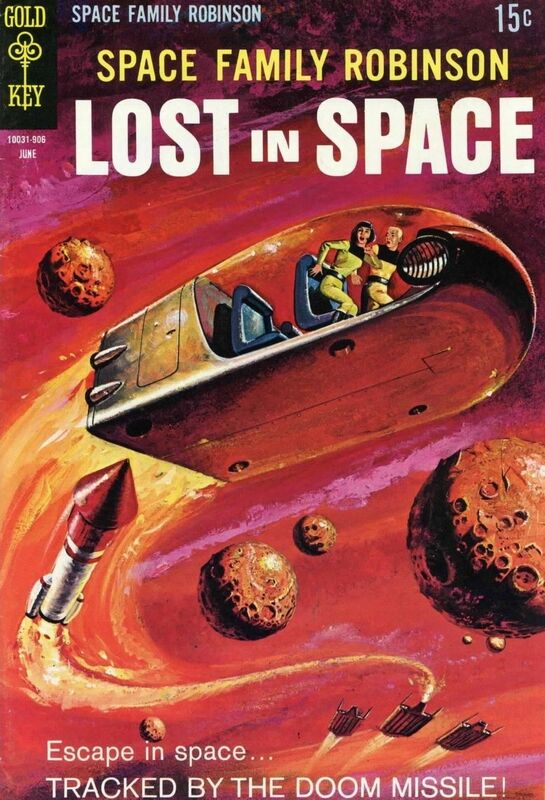 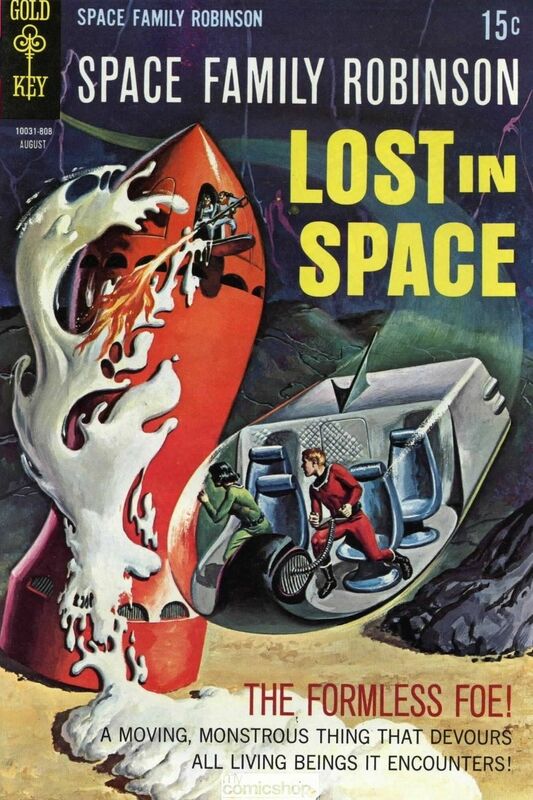 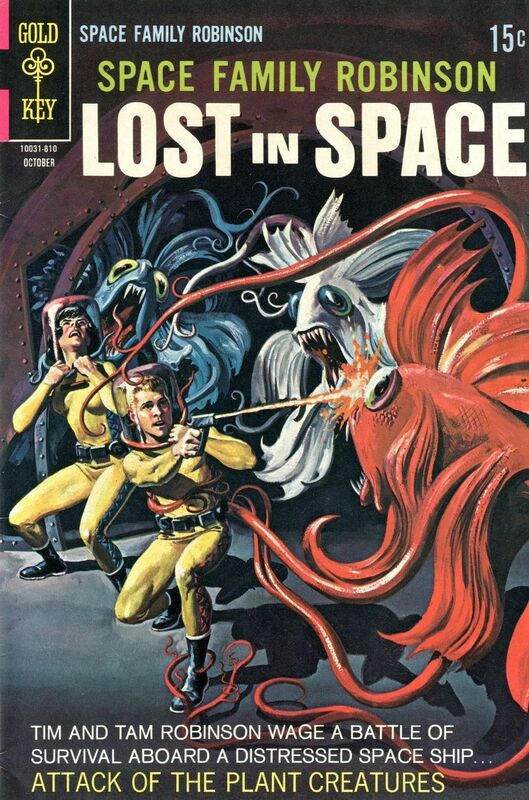 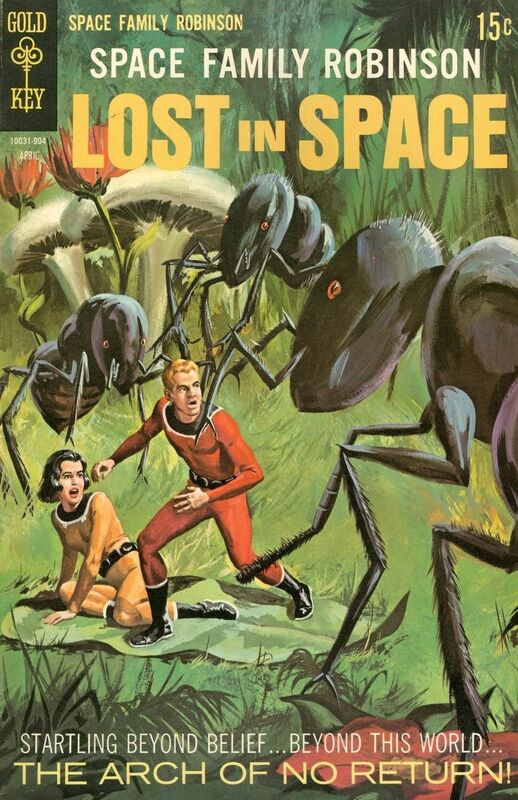 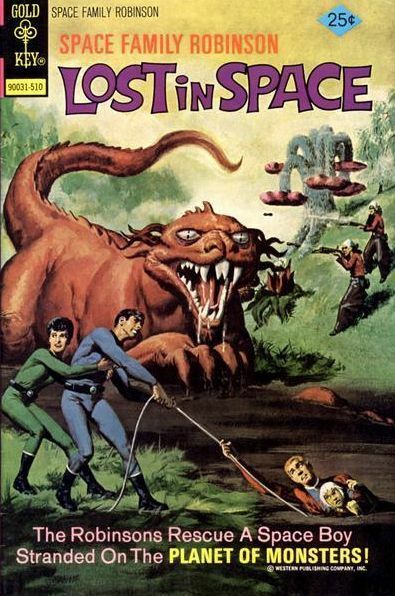 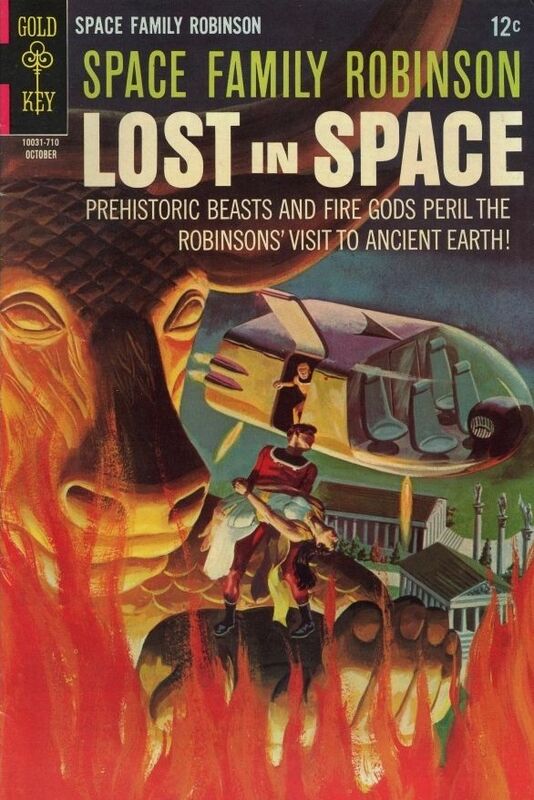 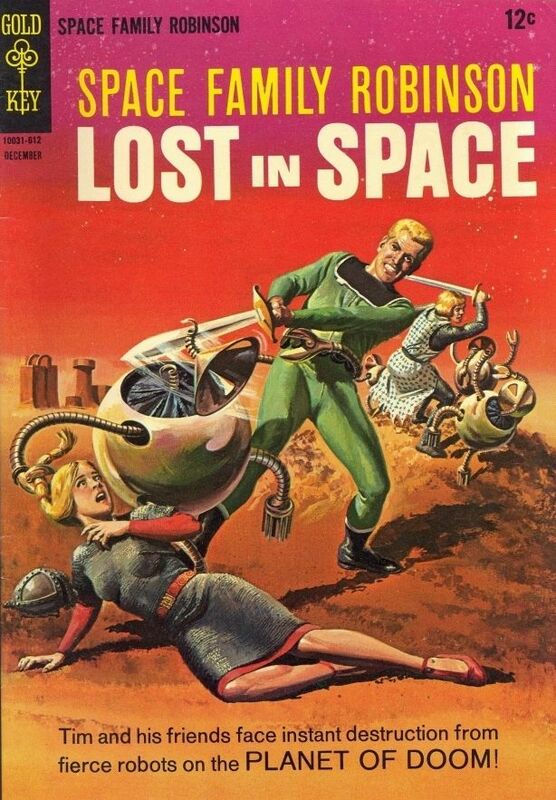 With issue #15 (January, 1966), the "Lost in Space" title was added to the cover. 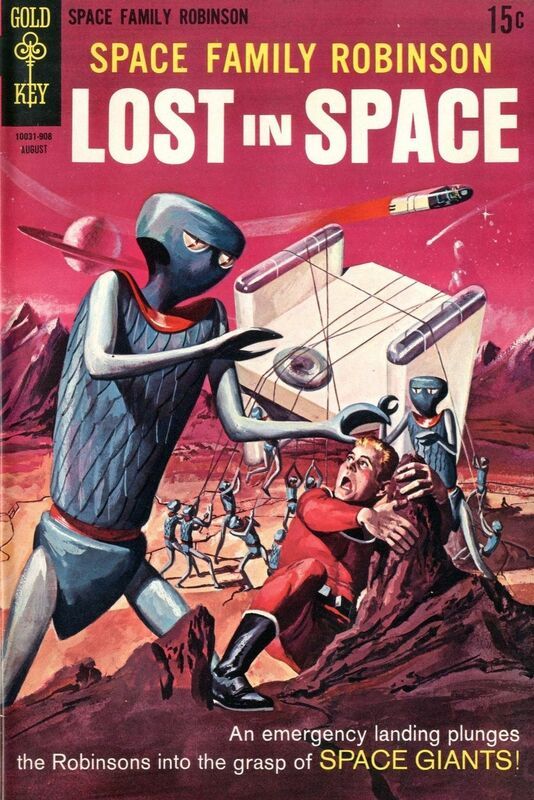 The book "Silver Age: The Second Generation of Comic Artists" by Daniel Herman explains that that when the Lost in Space TV series came out in 1965, it was obvious that it was inspired, at least in part, by the comic book, but CBS, the network airing the show, had never acquired the license from Western Publishing. 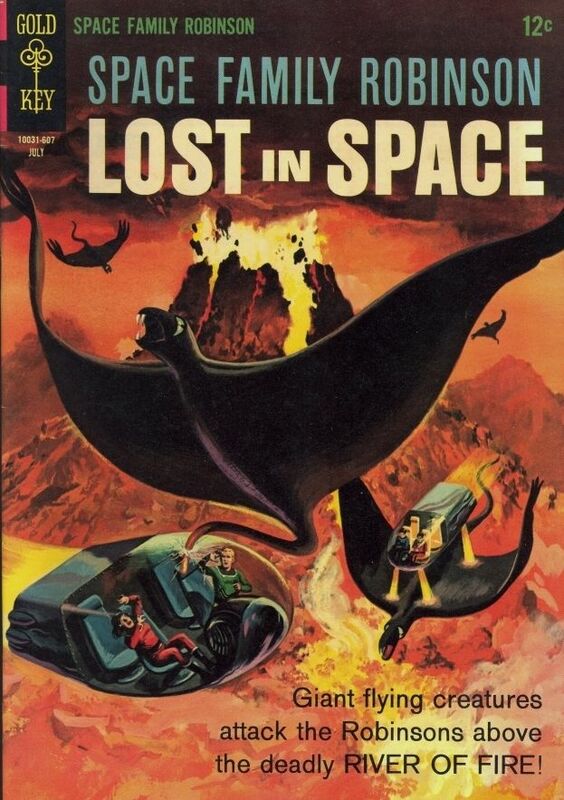 Rather than sue CBS or Irwin Allen, Western decided to reach a settlement that allowed them to use "Lost in Space" for the title of the comic book. 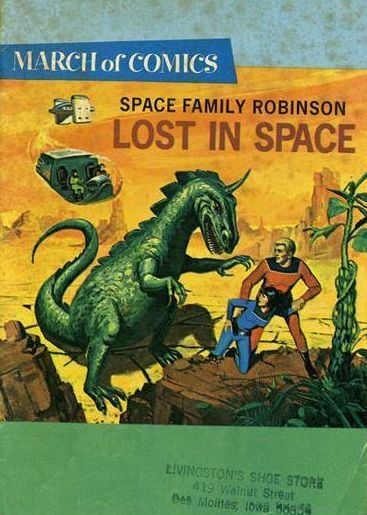 Since CBS and Irwin Allen licensed shows to Western, Western didn't want to antagonize them. 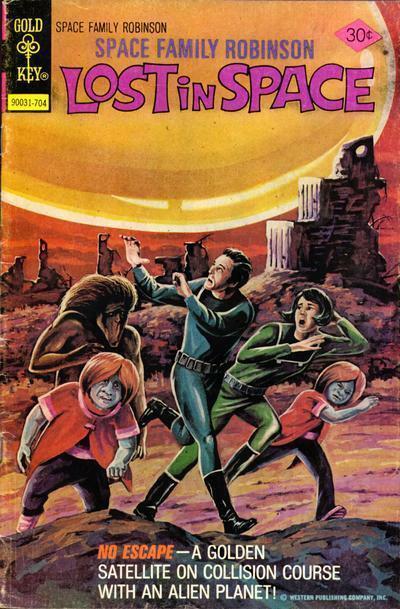 Also the TV show title probably helped sales of the comic book. 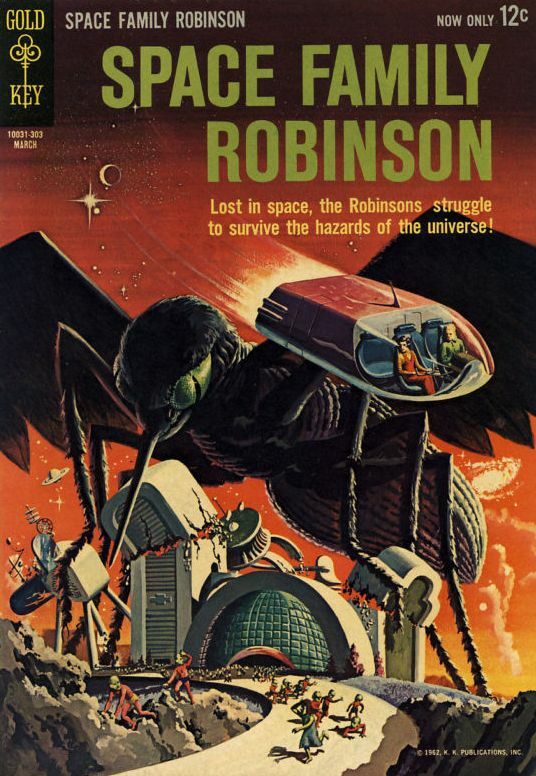 The title was cancelled with #36 (October, 1969). 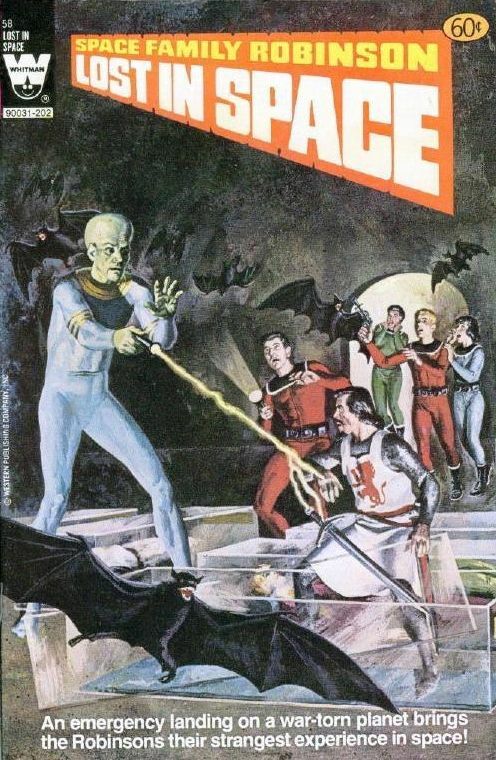 It would then be brought back in October, 1973, in part due to the popularity of Star Trek. 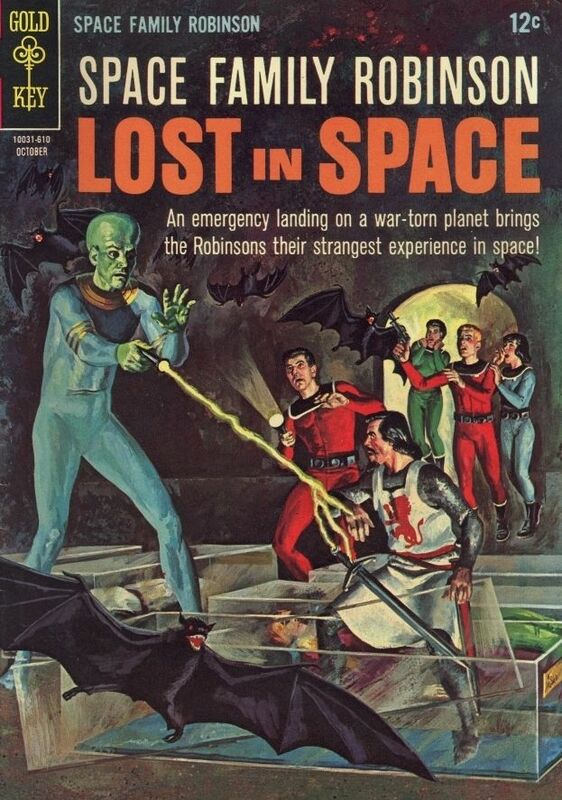 At this point, all issues between #37 and #44 had the tag "On Space Station One" added as well. 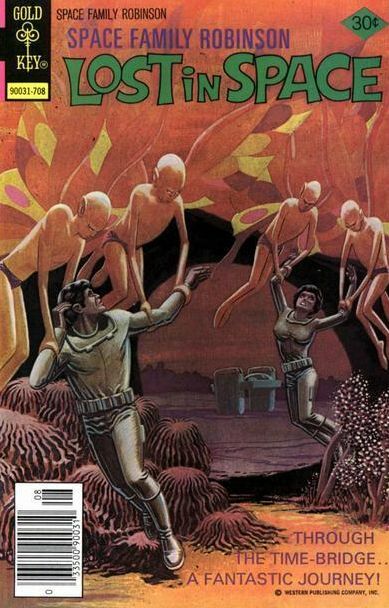 The title was again cancelled with #54 (December, 1977) (with #49 being a reprint of #38). 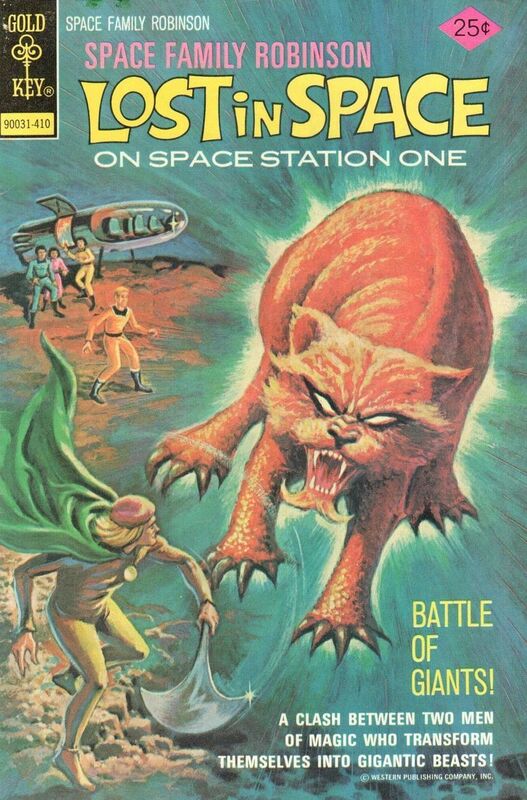 A further new story was published in Gold Key Champion #1 (1978). 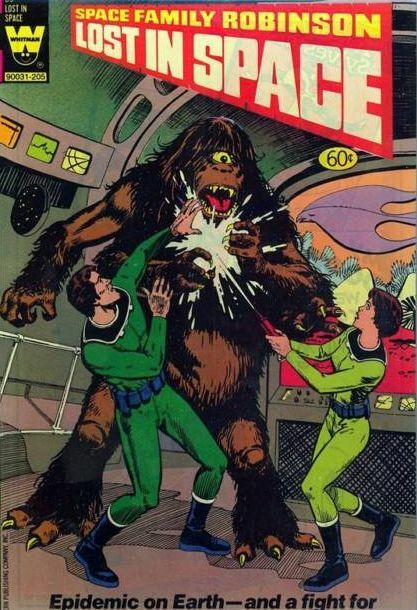 In 1981, the title was revived as a reprint title for issues #55-59 (1981-82) under the "Whitman Comics" line. 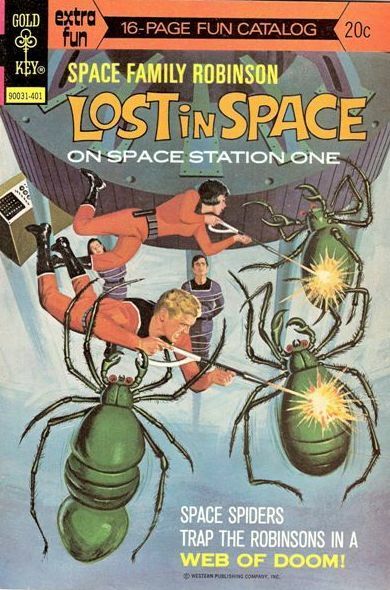 The comic was created by writer Del Connell and artist Dan Spiegle. 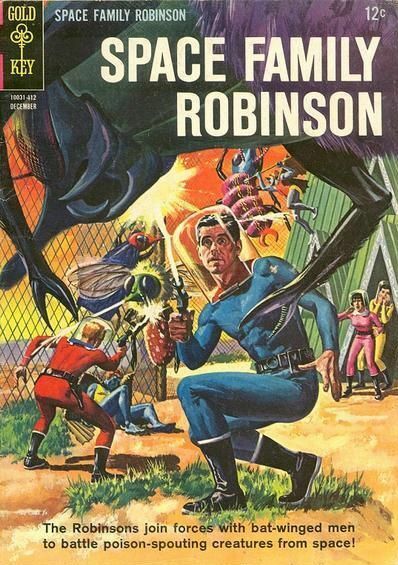 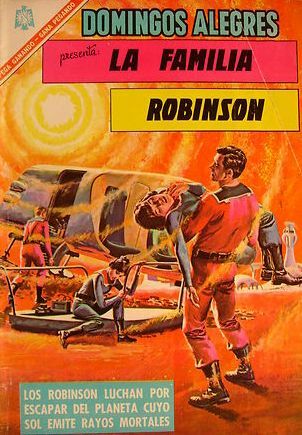 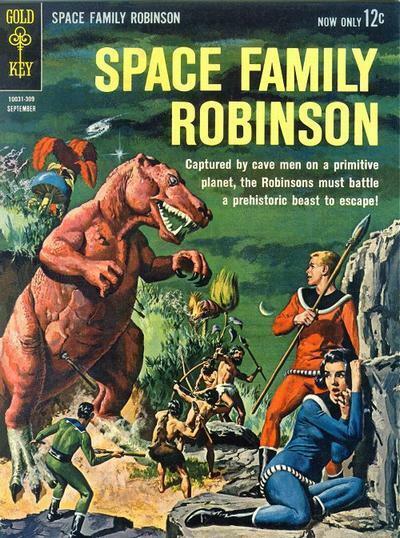 Gaylord Du Bois became the sole writer of Space Family Robinson once he began chronicling the Robinsons' adventures with Peril on Planet Four in issue #8. 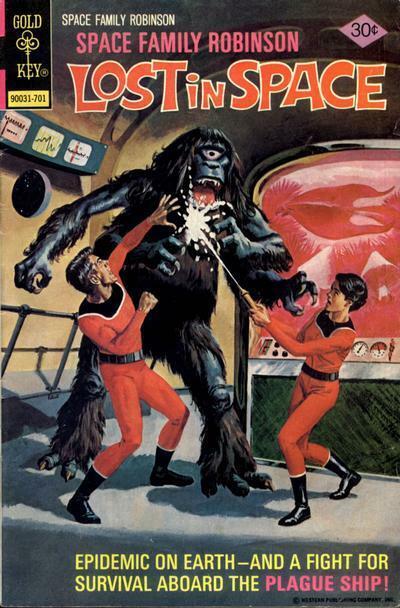 He had already begun the Captain Venture second feature beginning with Situation Survival in issue #6. 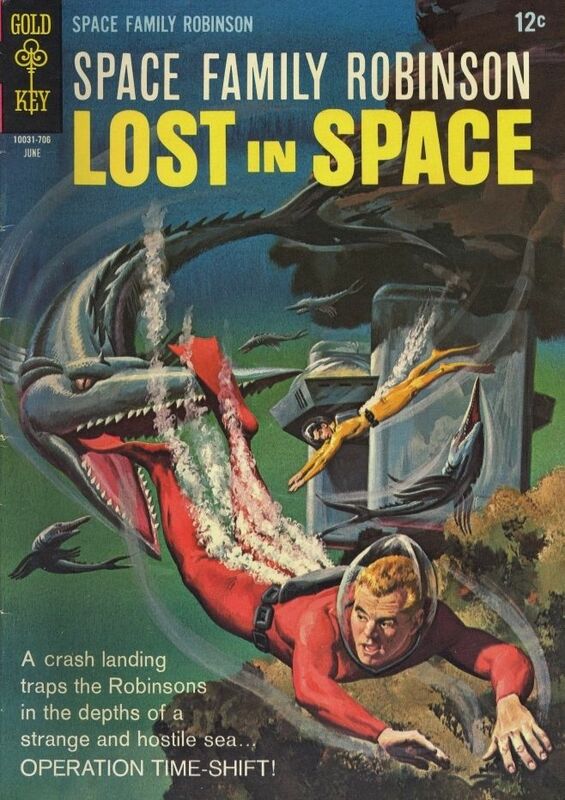 As was typical of Gold Key's adventure comics, all cover-art was painted, most often by George Wilson. 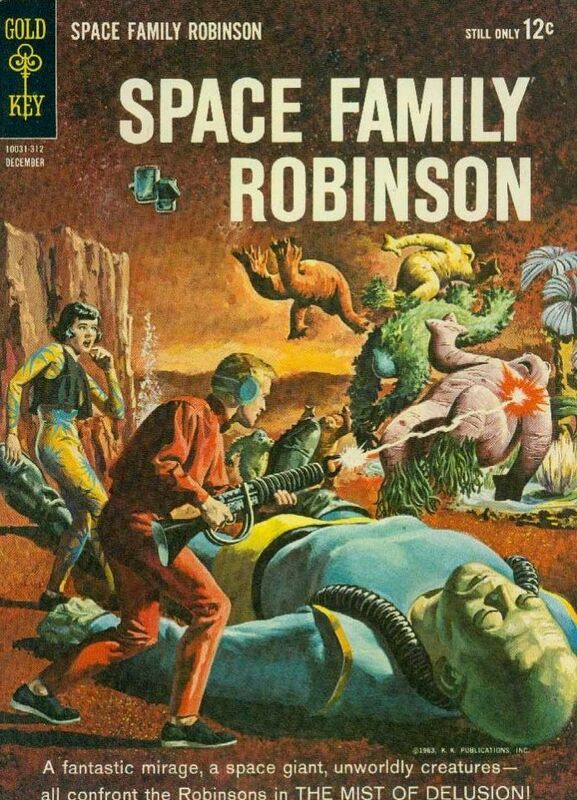 In the comic, the Robinsons were: scientist father Craig, scientist mother June, early teens Tim (son) and Tam (daughter), along with pets Clancy (dog) and Yakker (parrot). 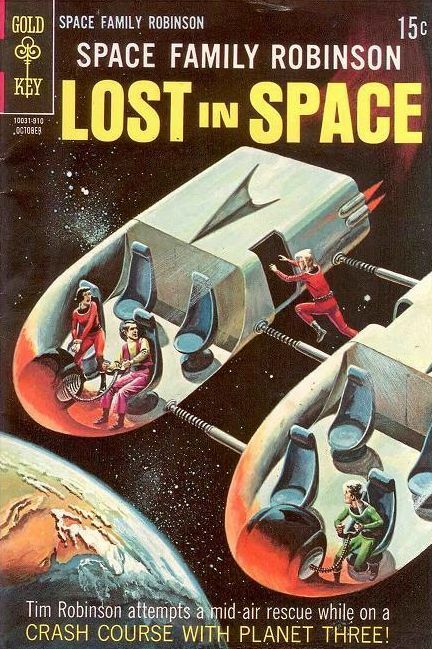 They lived in "Space Station One", a spacious moving craft with hydroponic gardens, observatory, and 2 small shuttle craft ("Spacemobiles"). 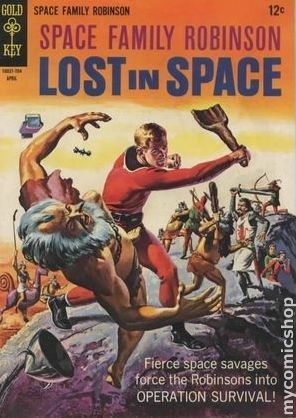 In the second issue, a cosmic storm deposited them far from Earth and they have adventures while they try to work their way home. 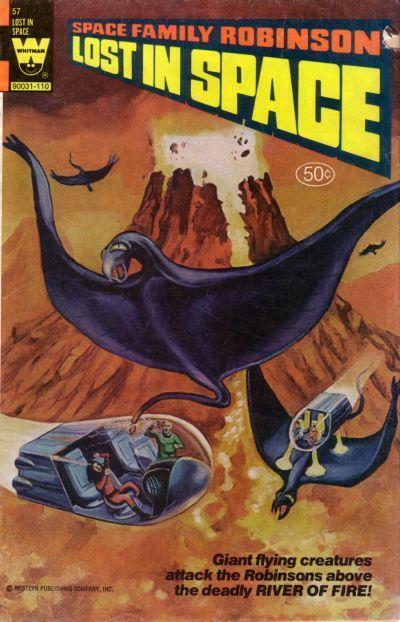 A backup series, entitled "Captain Venture and the Land Beneath the Sea", ran through issues #6-36 (1964-69). 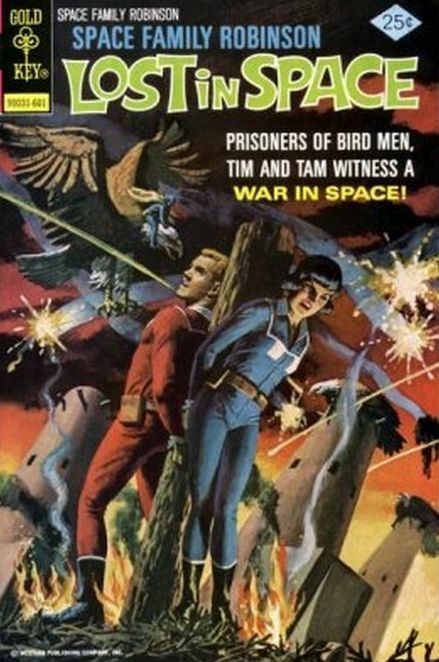 Gold Key would publish 2 reprint issues in 1968/69. 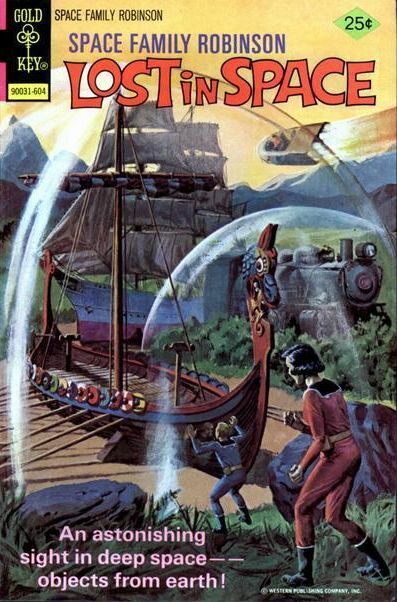 For some years the Overstreet Comic Book Price Guide has a notion that the series was created by famed Disney comic book artist/writer Carl Barks. 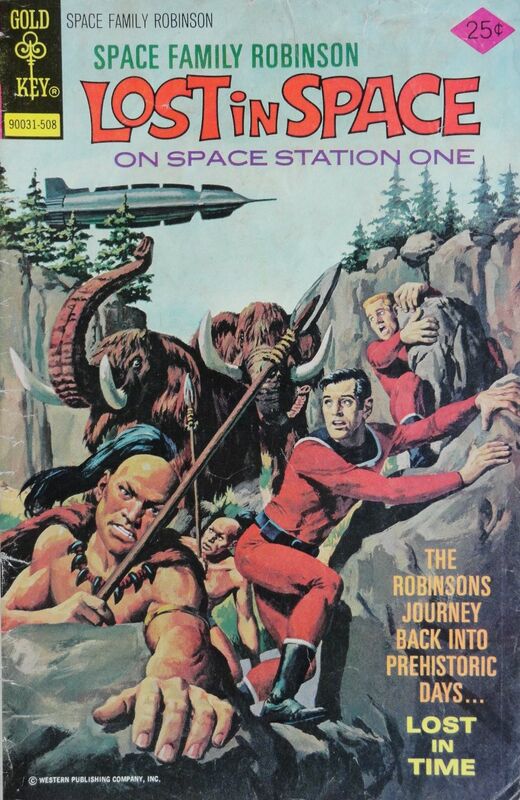 In fact Barks did suggest a Swiss Family Robinson in space comic to his editor Chase Craig in about 1960 but nothing came of it and the subsequent series was originated by people who hadn't heard of Barks' concept (which would have been more adventure oriented). 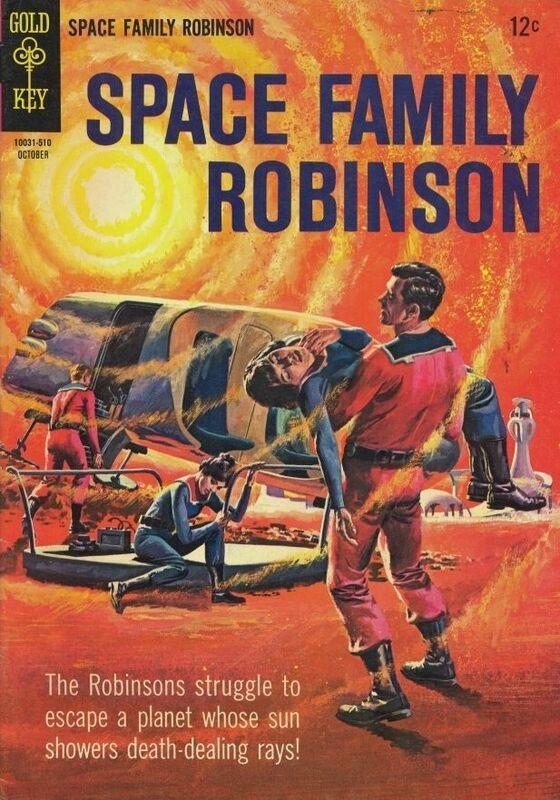 In August of 2011, Dark Horse Comics began the Space Family Robinson Archives hardcover reprint series. 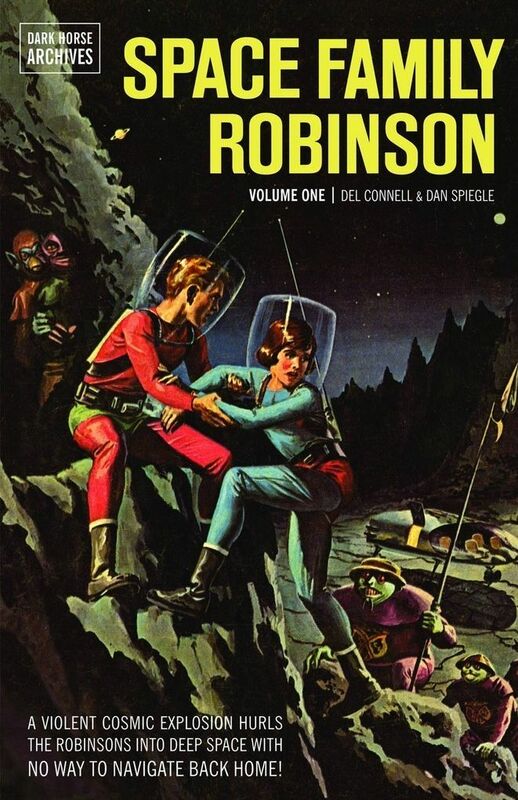 Volume 1 collects Space Family Robinson #1,2,3,4,5,6,7; Volume 2 collects Space Family Robinson #8,9,10,11,12,13,14; Volume 3 collects Space Family Robinson #15,16,17,18,19,20,21,22; Volume 4 collects Space Family Robinson Lost in Space #23,24,25,26,27,28,29,30,31 and March of Comics #320. 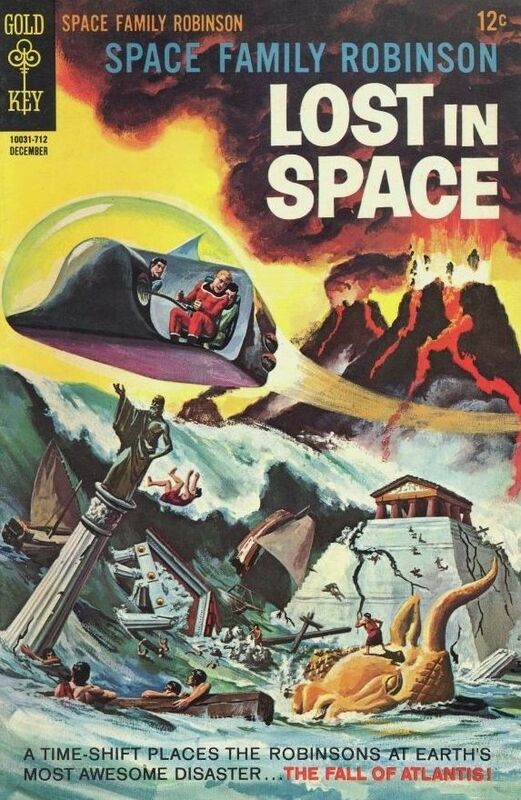 In 1966 the weekly UK publication Lady Penelope ("the comic for girls who love television") printed Space Family Robinson stories. 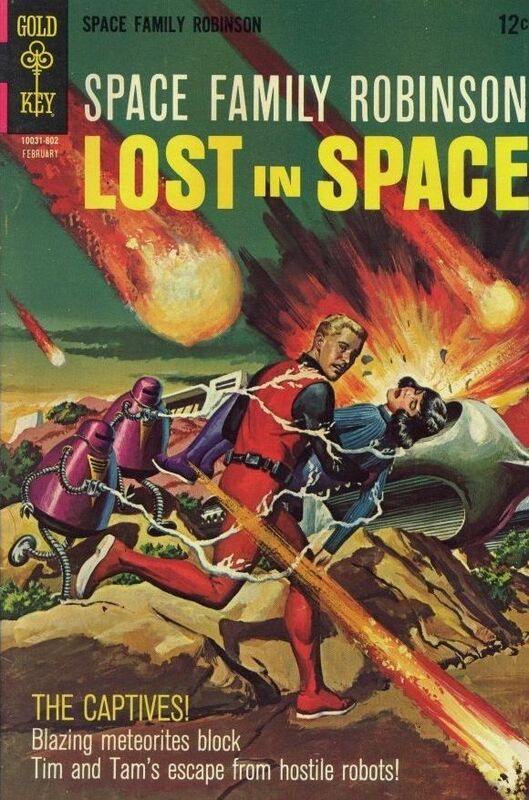 These used the same characters and technology as the Gold Key titles but were original scripts, not reprints. 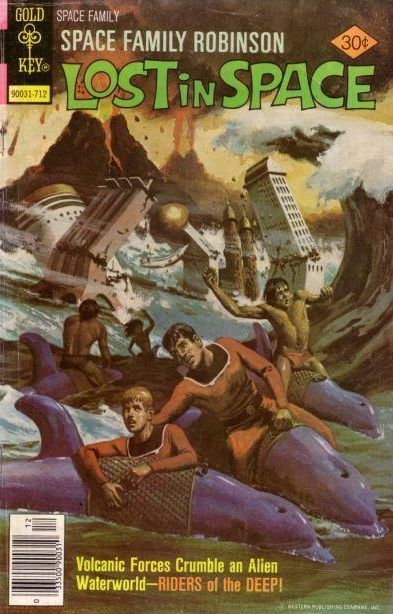 Authorship is not known for certain, although there is good reason to think that some may have been written by then sub-editor on Lady Penelope, Brian Woodford. 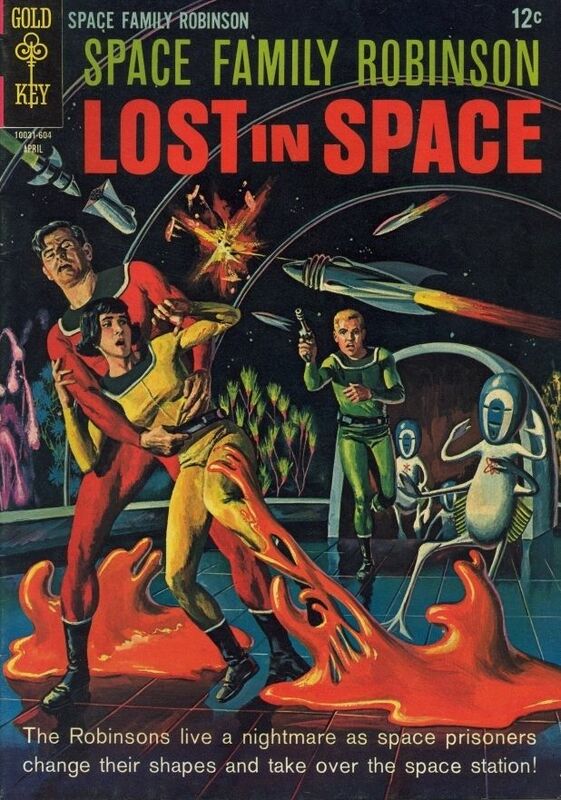 The artist was John Burns. 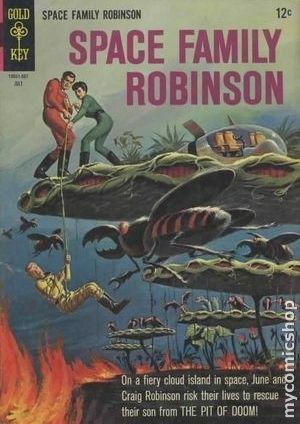 The 52 weekly instalments, printed in black and white, told six stories: 1.The Robinson family begin their mission and become lost when an explosion sends them far off course. 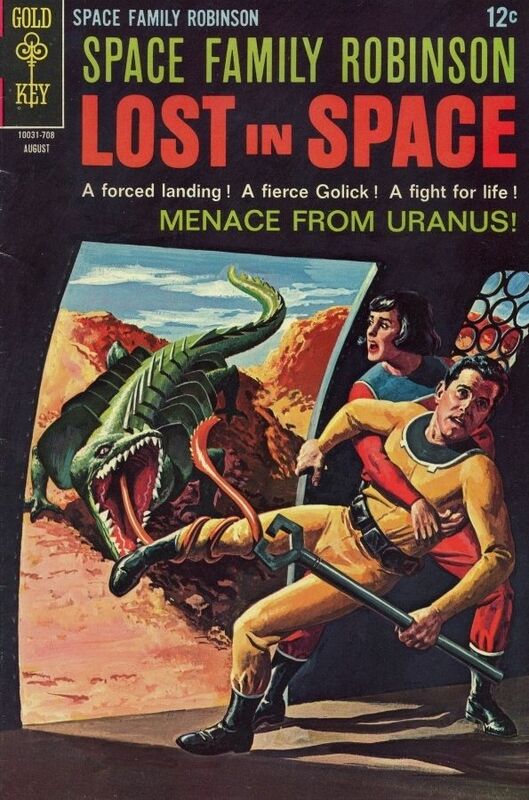 This is the only story based on the Gold Key comic books. 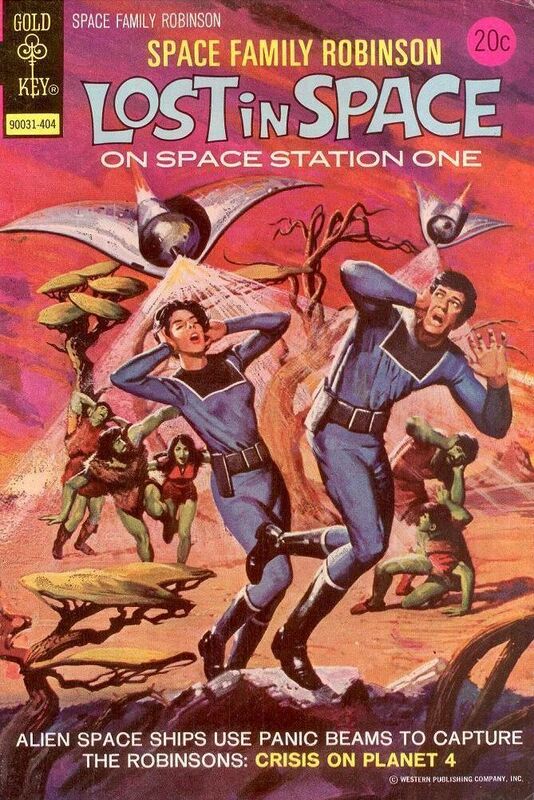 2.Unwittingly, they become involved in a war between two planets. 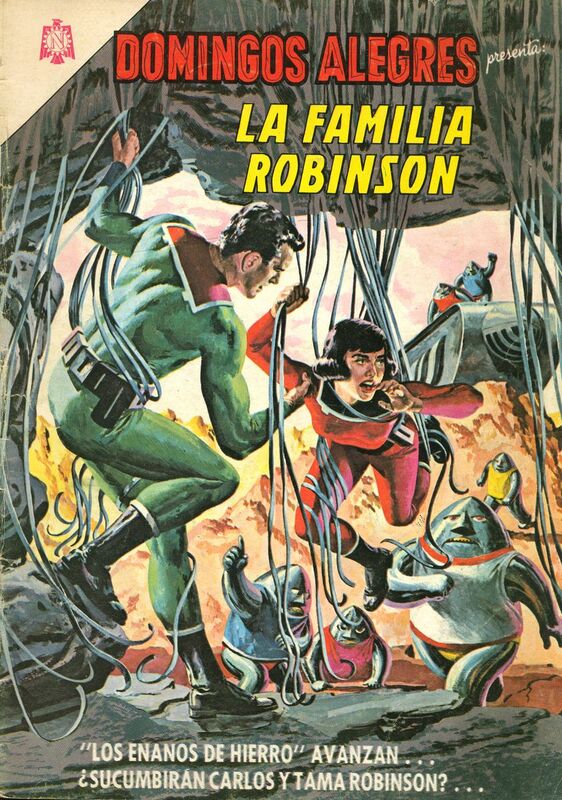 3.The Robinsons meet telepathic tripods whilst searching for materials to repair the Station's power source. 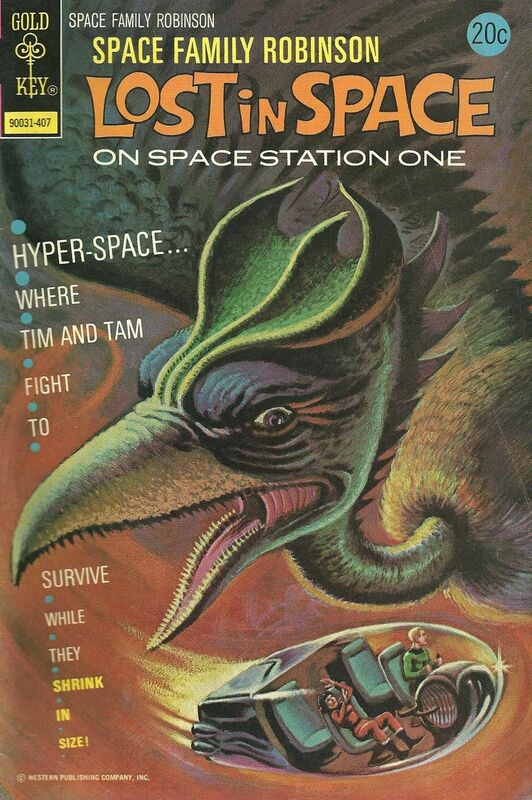 4.Tim and Tam are sent on a quest by aliens with the ability to restructure matter with their thoughts. 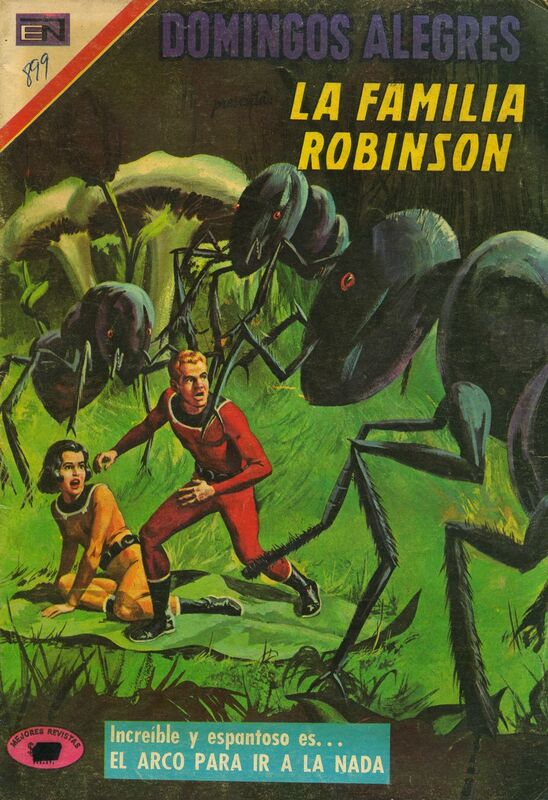 5.An alien claims the Robinsons must pay tax for travelling through his space, and demands Tam as payment. 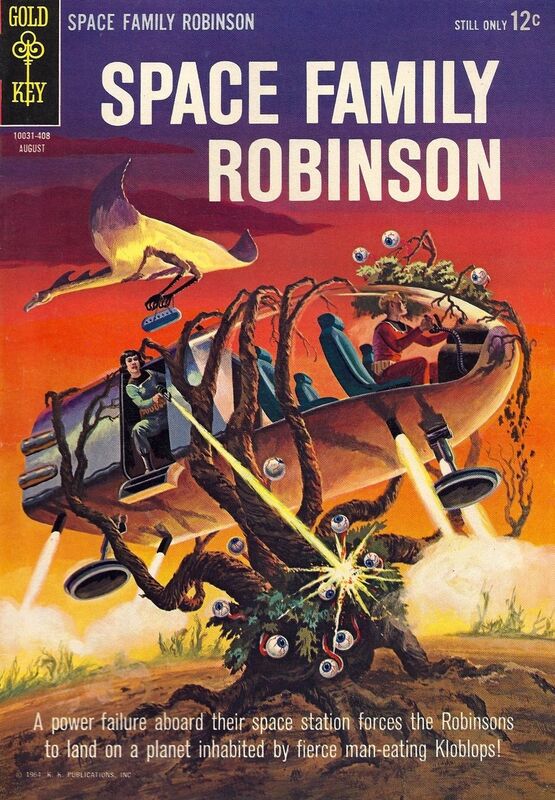 6.The Robinsons land on a duplicate of Earth, mistaking it for home. 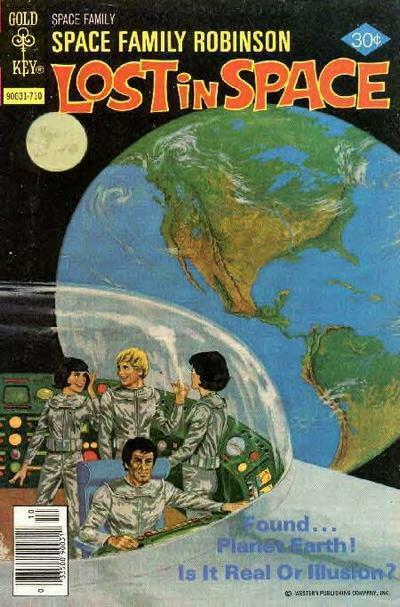 All six stories were reprinted in the Dutch comic TV2000. 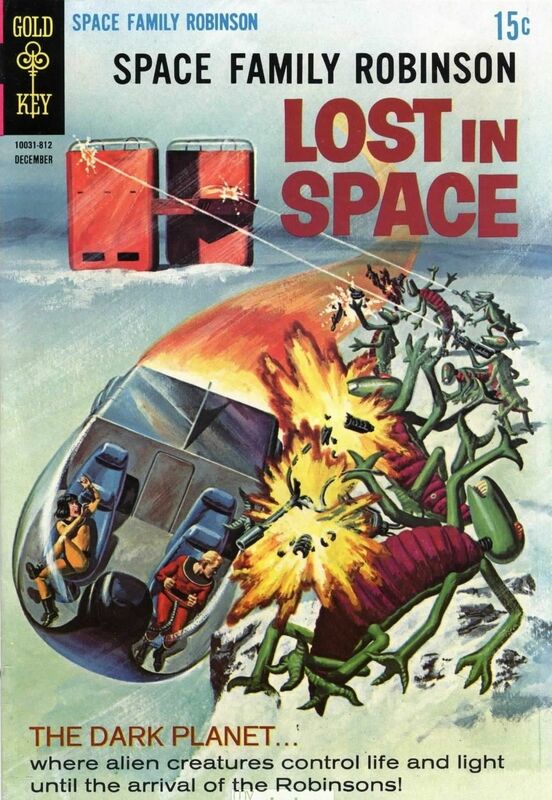 The Lady Penelope Summer Extra (1966) included a three-page story in which the Robinsons land on a recently abandoned planet. 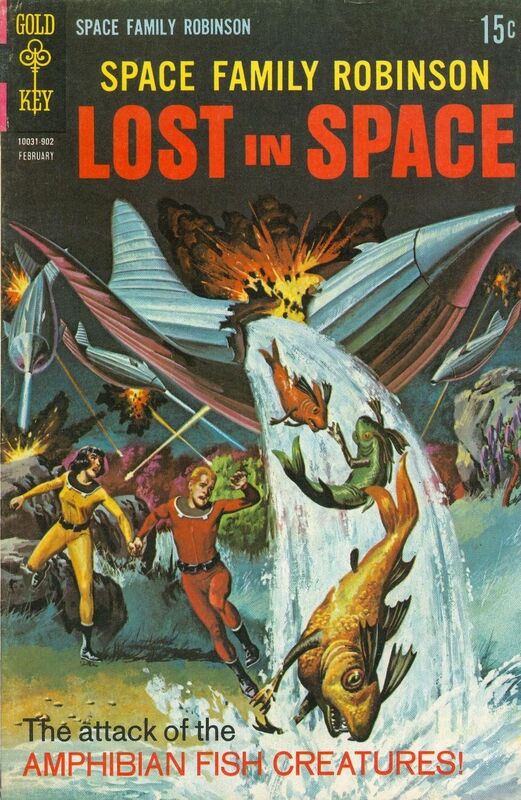 They discover that the hasty exodus was due to the approach of a massive gravity source. 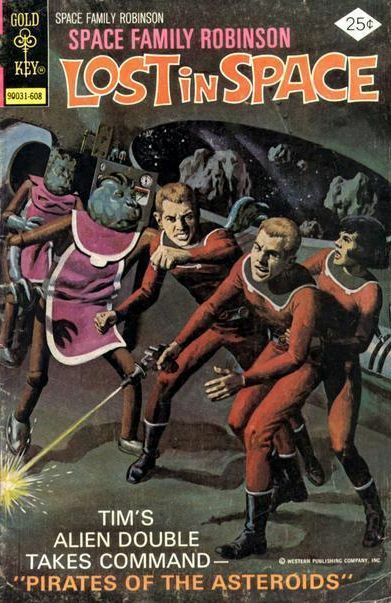 This story was reprinted in the TV2000 Thunderbirds Extra (1966) with the third page colored by the Dutch publishers. 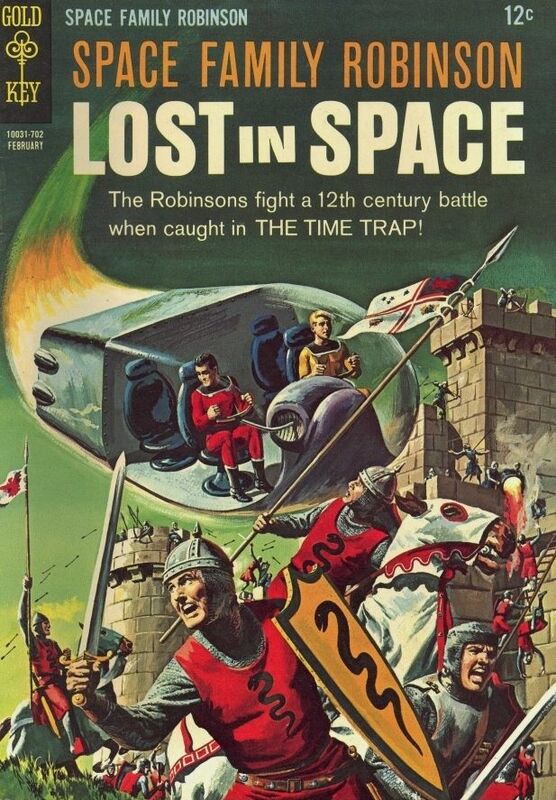 There was also a story in the Lady Penelope Annual for 1966. 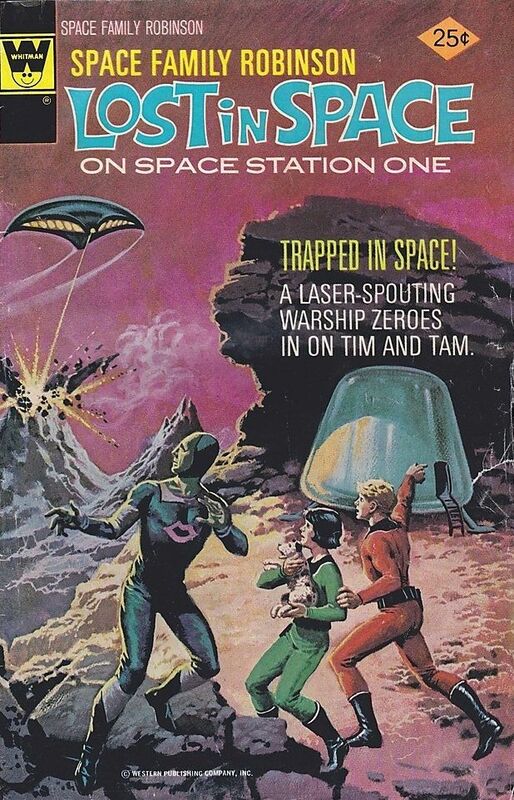 Unlike all the others, this one had a title, Tam Meets The Trygans, and told how Tam returns to the Station alone only to find it occupied by aliens intent on stealing it. 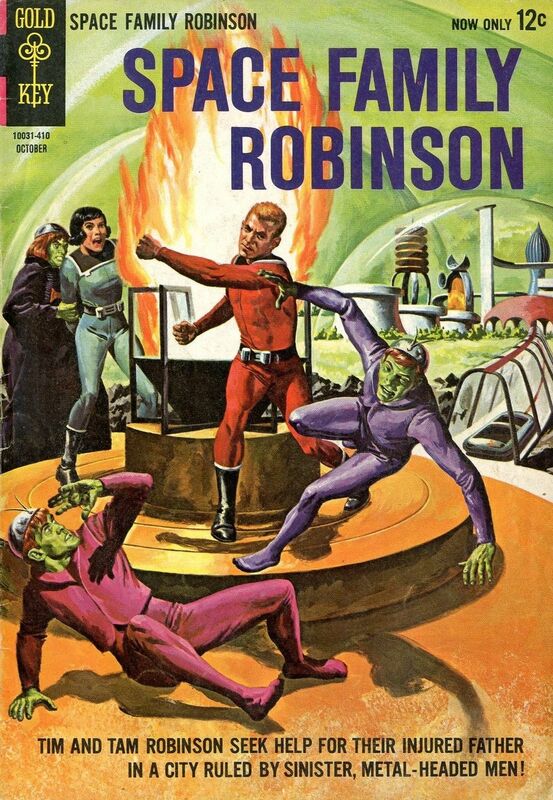 This is the only story printed in colour throughout, and the only one not drawn by John Burns. 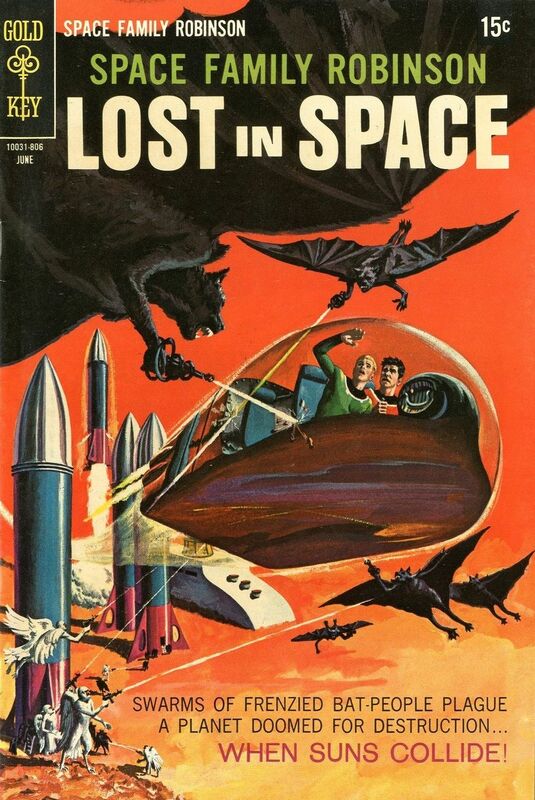 The artist has not yet been identified.